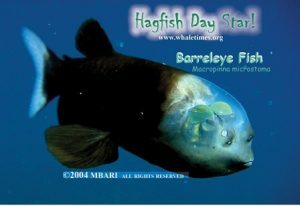 Barreleye, Hagfish Day Star | WhaleTimes, Inc. When it comes to eyes and transparency, the barrel eye fish might be the coolest fish in the sea. These deep-sea fish are found in water as deep as 3,330 ft (1015 m). Barreleye fish have been found in the Pacific Ocean, from the Bering Sea to Japan and Baja California, Mexico. Little is known about the barreleye, but scientists think they eat jellies. Unknown, but every animal has a predator! As you might have guessed, its common name describes its tubular eyes. (shaped like tubes). In the deep, being transparent isn’t unusual. Having tubular eyes isn’t new, either. But it wasn’t until deep sea scientists from the Monterey Bay Aquarium Research Institute (MBARI) caught one on film that the barreleye’s cool factor went up 100 points (okay scientists don’t rate cool factor…but maybe they should). Scientists observed the fish’s eyes pointing forward…then the eyes rotated upward, so the fish could see what was above it. It’s eyes are like the most awesome periscope system ever! In the deep, most animals hunt by looking up. They take advantage of what little surface light is available to spot a silhouette of something above. Having rotating eyes to see food above, then see it when it’s near the mouth is a great adaptation. The barreleye proves that observing animals in the deep via a submersible or ROV is THE best way to learn about them. Speaking of cool factor, read deep-sea fish expert, Dr. Jeffrey Drazen’s interview about the barreleye. Learn more about this discovery, watch a video of the barreleye, and discover more about the Monterey Bay Aquarium Research Institute’s deep-sea research. (www.mbari.org/news/news_releases/2009/barreleye/barreleye.html).